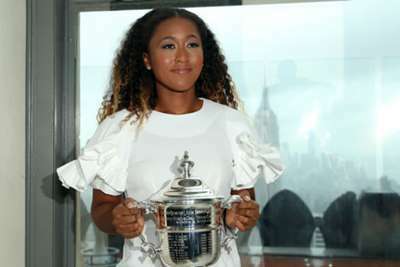 The 21-year-old claimed her first grand slam title at the US Open last month, beating idol Serena Williams – Bajin's former employer – in a controversial Flushing Meadows final. "Naomi definitely has the game to be one of the greats," he told DAZN. "She has a huge serve, she has a big forehand, she moves really well and she understands the game right now. "I do believe that there are certain things we're trying to improve on a bit more. But I don't see any limit to how many titles she can take or if she can be number one in the world. I truly believe that. "I just hope that I'm going to be the man helping her. If not, somebody else will. I do believe that she has greatness within herself." And Bajin claims his work has chiefly been on improving Osaka's mental game, helping her to keep her focus on the court. "It was definitely her mindset," he said. "It was very important for me that I realised that Naomi is such a perfectionist that she can focus too much on what isn't working on court, instead of what is. "[She needed to] maintain a more positive mindset and not be too hard on herself. That was very important for me. "Then to understand strategy wise, [to make sure] that she understands that certain shots in certain situations are better. It doesn't always have to go as hard as she can and full out. "Use other strengths of her game, maybe some that she didn't know she had, and know that there are different types of pressure to put on your opponent." "Everybody can beat everybody these days. We've had eight different grand slam winners in the last eight grand slams," he added. "I believe that the WTA Tour is as open as it has ever been before. "Everybody that's going to be in Singapore can beat everybody. They all deserve to be there - they're the best eight women in the world and it's going to be very interesting. "I think it's very hard to predict a favourite but, of course, if I put my money on it, it would be Naomi."